Jamaican sound engineer and musical aesthete Osbourne Ruddock aka King Tubby is widely credited with being the original dub creator. The results of his experiments in the early and mid-1970s pervade all areas of contemporary dance music. KING TUBBY’s instrument was the mixing desk, and like jazz musicians before him, his passion was finding ways to make it do things that hadn’t been done before. Born, Osbourne Ruddock, 28 January 1941, Kingston, Jamaica, West Indies. Died, 6 February 1989, Jamaica, West Indies. King Tubby grew up around High Holborn Street in Central Kingston before moving to the capital’s Waterhouse district in 1955. He started repairing radios and by the late 50s had begun to experiment with sound system amplifiers. By 1964 he was operating his own Tubby’s Home Town Hi-Fi, where he later incorporated a custom reverb and echo facility into his system. At the same time he was working as disc-cutter for Duke Reid and it was here that he discovered that he could make special versions of well-known rocksteady tunes. By cutting out most of the vocal track, fading it in at suitable points, reducing the mix down to the bass only, and dropping other instrumental tracks in or out, Tubby invented dub. Initially the technique was used for “specials” or dub plates – custom acetates made exclusively for sound system use. The spaces left in the mix allowed sound system DJs to stretch out lyrically, predating the emergence of US rappers by some years. Record producers soon began to see the potential of these versions. Joe Gibbs’ engineer, Errol Thompson, working at Randy’s Studio 17, had started employing rhythm versions as b-sides by 1971. To keep ahead of the competition, Tubby acquired an old four-track mixing console from Dynamic Studios. He then introduced further refinements – delay echo, slide faders, and phasing. By late 1971 he was working with producers such as Bunny Lee, Lee Perry, Glen Brown, Augustus Pablo and “Prince” Tony Robinson. The latter issued records that credited Tubby as mixer, including “Tubby’s In Full Swing”, the b-side to a DJ track by Winston Scotland. Throughout the 70s Tubby mixed dubs for all the aforementioned producers, in addition to Roy Cousins, Yabby You, Winston Riley, Carlton Patterson and Bertram Brown’s Freedom Sounds. His most important work, in terms of sheer quantity, was with Bunny Lee. Lee used Tubby for dub and voicing on rhythms he had built elsewhere with the Aggrovators session band. All the singers who worked with Lee at this time – Johnny Clarke, Cornell Campbell, Linval Thompson, Jackie Edwards, Derrick Morgan, Delroy Wilson, Horace Andy, John Holt and Owen Grey – made records with Aggrovators rhythms, voiced and mixed at King Tubby’s. Lee began to issue dub albums featuring Tubby’s mixes, and other producers soon followed that lead. Tubby’s name as mixer soon appeared on well over 100 albums. A generation of engineers trained under Tubby’s supervision, including King Jammy and “Prince” Phillip Smart, both subsequently finding success on their own terms. Throughout this period Tubby planned to build his own studio, and by 1988 he had begun to issue computer-generated digital music, featuring many of the new-wave ragga singers and DJs, including Pad Anthony, Courtney Melody, Anthony Red Rose, Pliers and Ninjaman, as well as established talents such as Cornell Campbell. Just when it seemed Tubby was poised to challenge top producers such as Jammy and Gussie Clarke, tragedy struck. On 6 February 1989, a lone gunman murdered King Tubby outside his home, the motive apparently robbery. The loss shocked Jamaican music fans and artists. 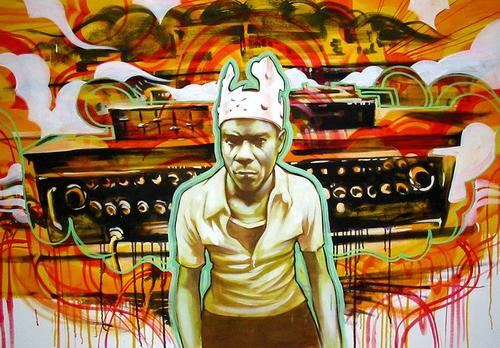 Many innovations, not only in Jamaican music but in other “dance” forms as well – the “dub mix”, the practice of DJing extended lyrics over rhythm tracks, the prominence of bass and drums in the mix – were developed by King Tubby, both on his sound system and in the studio during the period 1969-74. His place as a seminal figure in the music’s development through three decades is assured. Onedub Represents at Red Bull Culture Clash Birmingham!